GettyTheresa Mays hopes of a quick Brexit deal slipped away on Sunday. Theresa May’s Brexit plans risks falling apart after UK negotiators were forced to abandon plans to sign up to a provisional deal with the EU on Sunday. The deal could have kept all of the UK tied to EU customs and trade laws indefinitely after Brexit. However, several senior Cabinet ministers threatened to walk out over the deal with Conservative MPs plotting to install former Brexit secretary David Davis as prime minister. Cabinet rebels are set to meet on Monday evening to discuss what to do next. LONDON – Theresa May has been forced to scrap plans to sign up to a Brexit divorce deal after the prime minister came under intense pressure from her own Cabinet to pursue a more abrupt exit from the European Union. A provisional agreement between EU and UK negotiators fell apart on Sunday after the Brexit Secretary Dominic Raab flew into Brussels following threats from several Cabinet ministers to walk out of government and suggestions that Conservative backbenchers are now willing to topple May. May had been hoping to sign up to a Brexit divorce deal early this week ahead of the crucial October European Council summit in Brussels later this week. 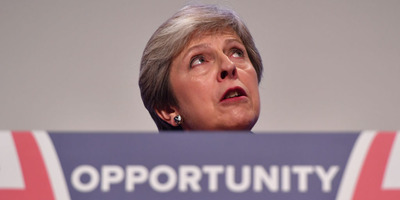 However, a provisional agreement between the two sides – that the UK could remain in a “temporary” customs union with the EU after Brexit as part of the Northern Irish “backstop” clause – caused fury among Conservative MPs who believe that Britain is being forced into remaining permanently tied to the EU. “In the last few days UK and EU negotiators have made real progress in a number of key areas. However there remain a number of unresolved issues relating to the backstop,” a UK government spokesperson said on Sunday evening. The backstop is the insurance policy for making sure the frictionless border between Northern Ireland and the Republic is maintained after Brexit. It will come into effect at the end of the proposed transition period, in January 2021, unless a new trading arrangement which protects the open Irish border is in place. On Sunday the UK was set to sign up to a backstop arrangement which had been reported since early last week, in which the UK would remain in a customs union and Northern Ireland alone would stick to single market rules. House of Commons leader Andrea Leadsom, International Development Secretary Penny Mordaunt and Work and Pensions Secretary Esther McVey were all poised to quit. Several Cabinet rebels are set to meet on Monday night to discuss what to do about the crisis in the party. The Democratic Unionist Party (DUP) which props up May’s minority government is also putting huge pressure on May, with its leader Arlene Foster suggesting that she is “ready” to force a no-deal Brexit rather than accept the provisional deal agreed by UK negotiators. The DUP is furious with plans for Northern Ireland to remain fully aligned with rules of the EU’s single market after Brexit as this would create new checks on the border between Northern Ireland and the rest of the UK. The row has left May’s premiership hanging by a thread with multiple reports suggesting that backbenchers are angling for the former Brexit Secretary David Davis to step in as an interim leader in order to deliver a “harder” form of Brexit outside customs and trade ties with the EU. Conservative MP Nadine Dorries said it may be time to “get Mrs May out of the way” in order to install Davis in Number 10 instead.